This book surveys the full panorama of ten centuries of Christian monastic life. It moves from the deserts of Egypt and the Frankish monasteries of early medieval Europe to the religious ruptures of the eleventh and twelfth centuries and the reforms of the later Middle Ages. Throughout that story the book balances a rich sense of detail with a broader synthetic view. It presents the history of religious life and its orders as a complex braid woven from multiple strands: individual and community, spirit and institution, rule and custom, church and world. The result is a synthesis that places religious life at the center of European history and presents its institutions as key catalysts of Europe's move toward modernity. Gert Melville is senior professor for medieval history at Dresden University. He is the founder and director of the Research Center for the Comparative History of the Religious Orders (FOVOG) and the author of scores of essays on medieval religious and cultural history. He is also the lead investigator on a number of long-term international projects. The most recent of these includes a study (established in conjunction with the Saxon and Heidelberg Academies of Sciences) of "Monasteries in the High Middle Ages" as focal points of innovation in European life. James D. Mixson is an associate professor of history at the University of Alabama. His recent publications include Poverty's Proprietors: Ownership and Mortal Sin at the Origins of the Observant Movement (Brill, 2009) and several essays on the history of late-medieval religious reform. He is also the editor (with Bert Roest) of A Companion to Observant Reform in the Late Middle Ages and Beyond (Brill, 2015). "This is the best of guides to the world of medieval monasticism: a fresh, novel, exciting, detailed, reliable account of how monastic life developed over twelve centuries and of the many paths to perfection and salvation it created for both women and men. Medieval monasticism had its failures, but it also never ceased to surprise by its capacity to adjust to complex, changing circumstances, to establish itself as a fundamental element of medieval economy and society, and to cater for the whole spectrum of religious life from eremitical withdrawal to firebrand preaching. Here is an exceptionally rich mine of materials drawn from all kinds of historical sources and thoughtfully presented in the light of an exceptional understanding of structures and ideals by a wonderful scholar." 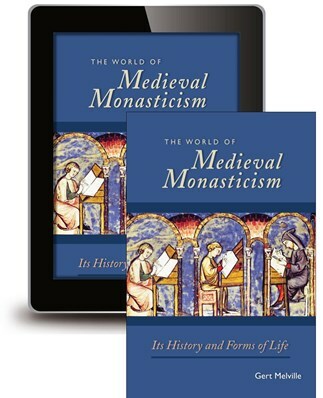 "With this splendid translation, English readers have access to a lifetime of scholarly thought and reflection on medieval monastic and mendicant life offered as a coherent narrative. Gert Melville has long been one of the leading interpreters of monastic life in Germany and, at present, perhaps the foremost sponsor of probing new scholarship. This book shows him at his best as a sympathetic student of medieval religious life set, as a good historian would, in its social and material contexts." "The World of Medieval Monasticism is the crowning achievement of the decades Professor Melville has devoted to the relentless study of medieval religious life in the West. Marked by a wealth of sources and shaped by the influential Research Center for the Comparative History of Religious Life at the University of Dresden, The World of Medieval Monasticism is an essential source in its own right for all those interested in the cultural history and spiritual inheritance of medieval religious life." "James D. Mixon's admirable translations introduces a wider English-speaking audience to the work of one of the foremost scholars of medieval religious life of the past forty years." "An indispensable reference work, which should certainly find a place in every university and monastic library, as well as in the personal collection of anyone with even a passing interest in the topic." "The doyen of monastic history has poured learning hitherto scattered among innumerable papers into the form of an elegant synthesis-a path-breaking sociological analysis of one of the most interesting medieval forms of life. Decades of scholarships and accumulated insights have been distilled into this volume." "Melville's book is a wonderful addition to medieval monastic history." "The fruit of long study of medieval monks, ascetics, mystics, and the rules that they lived by, The World of Medieval Monasticism is a lively and erudite companion for any reader interested in exploring the many astonishing forms of Western religious life." "It is with unrestrained and enthusiastic delight that one can welcome the translation into English of Gert Melville's superb study. We owe a great debt of gratitude to Cistercian Publications and all those who helped to make available in splendid English this magnificent contribution to monastic studies. I cannot recommend it too highly, whether to the most advanced scholar or to anyone looking for an introduction to the field." Sign up for Email and save 25% on your next order!